Preoperative planning is required to achieve optimal cosmetic and functional results after making a skin incision. The healing process causes wound contraction and scarring, which can compromise function and appearance. This chapter describes practical concepts to help achieve optimal results from surgical incisions. Major goals when planning a surgical incision are to reestablish functional soft tissue structural support and to give the most natural aesthetic appearance with minimal distortion after healing has occurred. Optimize the wound-healing environment to avoid infection, excessive contraction, and scarring. Inform the patient of objectives, time course of healing, and the possibility that additional procedures may be required to achieve optimal results. Obtaining accurate knowledge and assessment of nearby soft tissue and skeletal structures is crucial before making an incision. The face consists of 6 major aesthetic units comprised of forehead, eye/eyebrow, nose, lips, chin, and cheek. These aesthetic units can be subdivided into additional anatomical subunits. For example, the nose can be divided into nasal tip, dorsum, columella, soft tissue triangles, sidewalls, and nasal alar regions. Facial aesthetic units and subunits are visual anatomical boundaries. Light reflections and shadows along these facial aesthetic borders help conceal parallel scars. Evaluate skin laxity surrounding the planned incision. Appreciate the key functional and aesthetic structures nearby, such as cranial nerves and mobile facial structures (eg, eyelids, nasal alae, nasal tip, auricle, vermilion, commissures, philtral ridges). Correct orientation of planned incisions next to these mobile functional and aesthetic facial structures is important to avoid distortion when closing wounds. 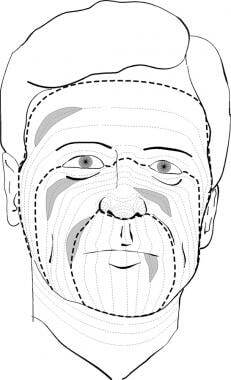 Optimally, perform an incision or an excision within or parallel to the relaxed skin-tension lines (RSTLs) of the face (see following image). The drawing shows relaxed skin-tension lines (RSTLs) of the face as seen on magnified facial image. Examples of drawn optimal fusiform excisions run parallel to RSTLs. (From Hom DB, Odland RM. Prognosis for Facial Scarring. In: Harahap M, ed. Surgical Techniques for Cutaneous Scar Revision. New York, NY: Marcel Dekker Inc; 2000:25-37, with permission). Specifically, RSTLs can be defined as the skin-tension lines that are oriented along the furrows formed when skin is relaxed. The resting tone and contractile forces of underlying facial musculature perpendicular to skin-tension lines contribute to RSTLs. Unlike wrinkle lines, RSTLs are not clearly visible on the skin. While pinching the skin, however, RSTLs can be observed from the furrows and ridges thus revealed. The closer an incision comes to lying within an RSTL, the better the ultimate cosmetic appearance of the scar. If possible, avoid making incisions perpendicular to RSTLs because the greatest amount of lax skin lies perpendicular to RSTLs. In addition to planning incisions along RSTLs or at the border of facial aesthetic units (ie, forehead, eye/eyebrow, nose, lips, chin, cheek), adherence to techniques of tensionless wound closure, wound edge eversion, and atraumatic handling of tissues optimizes scar appearance. Preoperatively marking the sitting patient with a surgical pen helps determine the effect of gravity on the surrounding tissue around the planned incision. Furthermore, it helps give a more accurate assessment of the planned incision in respect to the relaxed skin tension lines before local anesthetic is injected. In elective facial cosmetic surgery, proper preoperative incision planning is crucial. This is because one of the major priorities of cosmetic facial surgery is to maximally conceal surgical incisions. For example, in facelift surgery, the telltale signs of poorly placed incisions are temporal hair loss, unnatural appearance of the ear tragus, and posterior hairline distortion. In addition, for the male patient, special consideration is given by modifying facelift incisions in the preauricular area. In reconstructive head and neck surgery, proper planning of neck incisions are important to prevent carotid artery exposure if skin breakdown should occur after a radical neck dissection. If a wound cannot be closed primarily, reconstructive options may include using skin flaps or grafts for which the design of the incisions follows the same aesthetic unit and RSTL principles. Reconstructive options include healing by secondary intention, local or regional flaps, or skin grafts. When removal of the majority of a facial aesthetic unit is anticipated, excision of the remaining aesthetic skin unit can be considered before reconstructive coverage. This can help minimize scars by having them lie along the aesthetic unit boundaries. When a defect encompasses more than 1 aesthetic unit, each unit can be reconstructed as a separate entity. When considering incisions for local flap coverage, take advantage of the cutaneous vascular regions of the face to optimize viability of the flap and insure primary healing. These vascular regions are defined by the 4 main paired arteries of the face, which provide the major blood supply to facial skin. Major arteries to the facial skin are (1) the supratrochlear artery, which contributes to the central forehead and palpebral region; (2) the supraorbital artery, which perfuses the medial forehead region; (3) the temporal artery, which branches into superficial temporal and transverse facial arteries supplying the temporal forehead, lateral cheek, and periauricular regions; and (4) the facial artery, which leads into the superior and inferior labial, angular, and palpebral arteries, thereby perfusing the central and lower mid face. In planning elective procedures, over-the-counter products that decrease clotting should be discontinued, if possible, 14 days before incisions are made. These products include aspirin, aspirin-related products, gingko biloba, ginseng, flax seed, and vitamin E. This is because a decreased ability to clot increases the risk for hematoma formation and later subdermal fibrosis, resulting in skin elevation (pincushioning). 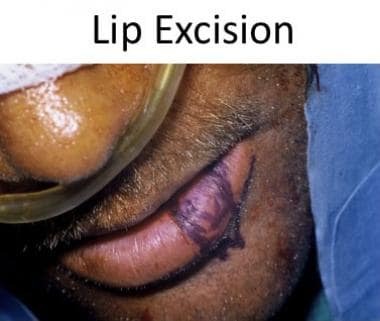 When planning the most appropriate surgical incision for lesion removal, consider the possible defect that could result after excision. Skin incisions can be made with a variety of surgical blades or lasers. When incisions are made within a hair-bearing surface, one can place the blade parallel to hair follicles to prevent their transection and damage. In regard to incisions within the hairline during facelift surgery, 2 options are possible. One can either bevel the knife blade perpendicular to the shafts to allow for the hair to grow through the advanced skin flap incisions or bevel the knife blade parallel to the hair shafts to minimize trauma to the hair follicles. When a fusiform skin incision is planned, the long axis of the fusiform excision should follow RSTLs (see following image). To minimize trapdoor scar deformities, rectangular-shaped incisions are better than curved incisions, and gentle undermining of surround tissues helps as well. To minimize a dog-ear deformity during closure, the angle of the fusiform apex should be less than 30°, and the lengths of each side of the incision should be made equal to each other. When such an angle cannot be made, an M-plasty can be made at the apex to minimize a dog-ear deformity or shorten the scar length (see following images). Planned wedge excision of lower lip. An M-plasty was performed at the apex to shorten the incision to prevent the scar from crossing the mental sulcus. Evaluate the planned skin incision in its relationship to the facial subunits in attempting, as much as possible, to achieve symmetry with the contralateral normal face. The contralateral normal facial region can serve as a helpful visual template for comparison. When obtaining hemostasis close to peripheral nerves, careful bipolar cauterization or suture ligature is recommended. Evaluation of wound type (ie, laceration, tissue loss) and wound depth (i.e., subcutaneous, facial musculature, cartilage, bone) is critical in planning the best closure method. Determine the extent of tissue loss, viability of skin edges, and angulation of wound edges. Devitalized tissue margins can be sharply débrided. In addition, perform careful undermining of surrounding tissues to minimize tension on the incision closure in order to minimize a widened scar. If possible, perform primary closure under minimal or, ideally, no tension. For closing deeper wounds, anchor subcutaneous sutures should be placed to approximate the skin edges to reduce tension on the skin surface, minimizing wider scars. Absorbable buried suture can be used to approximate deeper layers to avoid excessive tension on the skin. Nonabsorbable or absorbable sutures can be used on the skin surface with gentle eversion of skin edges. Generally, use 5-0 to 3-0 absorbable sutures for deeper layers and 6-0 to 5-0 sutures (permanent or absorbable) for skin. Differential undermining of wound edges in the subcutaneous plane may be needed to avoid distortion of nearby structures. Accomplish this by creating a subcutaneous plane on one side of the wound. Perform this technique only to advance the undermined side of the wound so that the nonundermined side will not be as mobile, thereby preventing distortion of nearby structures. A "trapdoor" deformity resulting from a beveled wound edge can be prevented by conservatively excising the excess skin tangentially to its wound surface to create a more vertical skin edge. Also excise the opposite skin edge to match it. Perform undermining within the same depth of plane on each side of the wound to allow for correct reapproximation of the corresponding tissue layers. 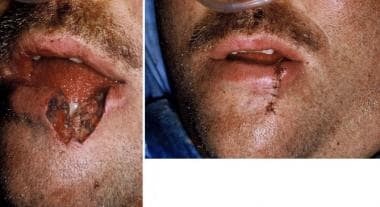 Facial scarring can be minimized by adherence to meticulous techniques of tensionless incision closure, wound edge eversion, and placement of incisions within RSTLs. If the defect cannot be closed primarily, additional surgical planning is required. Reconstructive options depend on deficit volume, quality of required replacement tissue, and vascular status of the defect site. Reconstructive choices include (1) healing by secondary intention, (2) skin grafts (full-thickness or split-thickness), (3) local flaps (random or axial), (4) regional flaps, and (5) free flaps. The defect complexity depends on the location, tissue layers removed, surface area missing, and orientation to facial aesthetic units and RSTLs. Ideally, repair missing tissue with tissue similar in color, texture, and thickness. To obtain appropriate contour and projection, replace the missing supporting bone and cartilage framework to give adequate support for natural contour. Healing by secondary intention is a treatment option for superficial wounds. This process occurs when the wound is left open, allowing it to spontaneously contract and epithelialize on its own. Healing by secondary intention is inappropriate for complex defects where multiple tissue layers are missing and structural support is needed. Cosmetic results of a defect healing by secondary intention depend upon the facial region involved. Concave facial surfaces (eg, medial canthus, temple, nasofacial crease, nasomalar grooves, auricle) heal with good results. Cosmetically, convex facial surfaces located on the nose, cheek, chin, lips, and helix do not heal as well by secondary intention. At these regions, depressed and hypertrophic scars frequently occur. Disadvantages of healing by secondary intention include (1) a longer period of healing; (2) often, increased hypopigmentation of reepithelialized scars; and (3) more contraction of surrounding soft tissue, which causes drifting of neighboring structures. Cutaneous wound healing consists of a highly coordinated cellular response following tissue injury. If healing is impaired, excessive scarring frequently results. Factors contributing to poor healing often result in scarring. Hence, the primary goals after closing an incision are to (1) maintain an optimal wound-healing environment, (2) minimize infection, (3) débride devitalized tissues, (4) maintain vital structural support, (5) maintain tensionless wound closure, and (6) prevent hypertrophic scarring. In the setting of high risk for poor healing (eg, infection, poor nutrition, previously irradiated skin, poor skin vascularity, diabetes, steroids), vigilance is especially important in maximizing the wound-healing environment. To maximize healing, a patient should not take tobacco products. Débride necrotic tissue to decrease infection risk. Maintain fresh wound edges along the incision to encourage epithelialization. Irrigate copiously to clean the wound and remove foreign bodies. Irrigation can be performed with normal saline or commercial wound cleanser. Irrigation is the single most effective technique to accomplish wound cleaning. Obtain hemostasis and place drains to prevent any excess fluid collection (eg, hematoma, seroma) and to avoid infection. Absorb excess wound exudate to prevent maceration of surrounding skin. Divert any salivary drainage away from the wound to minimize bacterial contamination. Maintain a moist wound environment with topical ointments or hydrogels to encourage epithelialization. Protect the wound from trauma. In wounds with potential for infection, institute appropriate oral and topical antibiotics for 7-10 days. Abrasions and wounds can be covered with hydrogel sheeting for exudative wounds or clear transparent dressing (ie, Tegaderm, OpSite) for nonexudative wounds. To avoid cellular damage, do not repetitively apply skin cleansers (eg, hydrogen peroxide, Betadine, Hibiclens) in a wound. After 5-7 days, remove facial skin sutures and apply Steri-Strips for 1 week to decrease tension to the incision. If an incision appears to be developing into a hypertrophic scar, consideration can be given to using injectable triamcinolone acetate, Cordran tape, or topical silicone-gel sheeting. A sign that excessive scar formation could be developing is a persistently nontender, erythematous, raised-skin surface present after several weeks. For at least 6 months, do not perform aggressive scar revision to allow for normal scar maturity. When scar segments do not follow RSTLs, surgeons may choose to revise unsatisfactory scars after 6 months with multiple Z-plasty, geometric closure, or W-plasty. Earlier scar revision intervention is indicated if facial function will be compromised or distorted from contraction (ie, compromising eye closure, mouth movement). Inform patients that it takes at least 6-12 months for a scar to mature to its final appearance. Adjunctive camouflage makeup can be a helpful conservative measure to reduce scar noticeability. Dermabrasion on the skin can be considered after 6 weeks of incision closure to help smooth out surface irregularities. Scars mature over a 6- to 12-month period after an incision. The incision strength of the scar will only reach 80% of the original strength of the skin. Incisions in the face that lie perpendicular to the lines of Langer are thought to heal more poorly with conspicuous scarring. Two clinical studies have reported the possible benefits of injecting botulinum toxin by the incision to minimize scarring by temporarily paralyzing the surrounding muscles. [3, 4] This concept in using botulinum toxin is to temporarily reduce the distracting effect of muscle pull on the incision, thereby minimizing tension on the healing wound edges until the collagen matures. Other methods to reduce scars may use antiproliferative cytokines (eg, transforming growth factor-beta 3 [TGF-beta 3]) Early phase I and II clinical trials in Europe testing TGF-beta 3 were encouraging; however, phase III trial endpoints were not reached. The strategy of prophylactically administering cytokines to reduce scaring during wounding remains an intriguing concept. Hom DB, Dresner H. General approach to a Poor Healing Wound - A Practical Overview,. Hom DB, Hebda PA, Gosain AK, Friedman CD. Essential Tissue Healing of the Face and Neck. Shelton, CT: BC Decker and PMPH-USA; 2009. 317-329. Hom DB, Hom KA. Do topical products reduce postincision scars?. Laryngoscope. 2014 Jun 19. [Medline]. Gassner HG, Brissett AE, Otley CC, Boahene DK, Boggust AJ, Weaver AL. Botulinum toxin to improve facial wound healing: A prospective, blinded, placebo-controlled study. Mayo Clin Proc. 2006 Aug. 81(8):1023-8. [Medline]. [Full Text]. Wilson AM. Use of botulinum toxin type A to prevent widening of facial scars. Plast Reconstr Surg. 2006 May. 117(6):1758-66; discussion 1767-8. [Medline]. So K, McGrouther DA, Bush JA, et al. Avotermin for scar improvement following scar revision surgery: a randomized, double-blind, within-patient, placebo-controlled, phase II clinical trial. Plast Reconstr Surg. 2011 Jul. 128(1):163-72. [Medline]. Jackson IT. Local Flaps in Head and Neck Reconstruction. St. Louis, Mo: Quality Medical Publishing; 2007. Hom DB, Odland RM. Prognosis for Facial Scarring. Harahap M, ed. Surgical Techniques for Cutaneous Scar Revision. New York, NY: Marcel Dekker; 2000. 25-37. Single Over Multiport Laparoscopic Colectomy: Only Benefit Cosmetic?